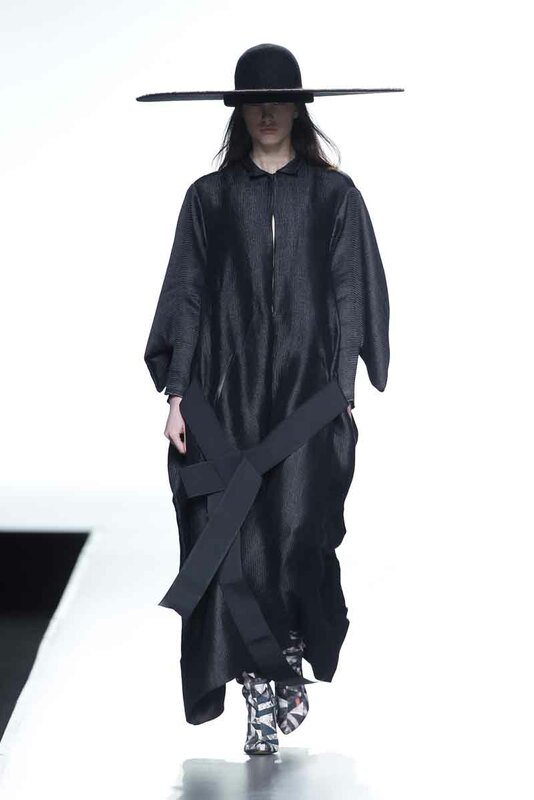 On Saturday, February 15, 2014, at the Feria de Madrid, Martin Lamothe unveiled the Martin Lamothe Fall 2014 collection during Mercedes-Benz Fashion Week Madrid. Chance, fortune, destiny … Martin Lamothe has sought inspiration in the world of chance for the brand’s Autumn/Winter 2014-2015 Collection. Having researched various beliefs that base destiny on an individual’s luck, such as tarot and the cosmological systems of different societies, Martin Lamothe presents a world full of unknowns in which belief and magic emerge as the only means of moving forward. The unknown leads us towards an intense collection that is split between warm and cold colour versions, the latter always dark. The only point of light consists of the “fortune” prints in gold and grey, worked in open and closed pleats for greater rigidity. With regard to materials, Martin Lamothe focuses on leather in order to create a superhuman and ritual sensation. The leather is treated in different ways and features different quality levels: split leather, glace lamb and cowhide; laminated, sealed, faded and, above all, dyed finishes combine with Alcantara fabrics; conglomerated and new and original fabrics imitate leather in order to create a more diverse range of forms and textures. The collection presents a dichotomy between drama (texturised draping) and absolute sobriety (geometric forms and cuts). Trompe l’oeil in quilted fabrics in imitation of referential clothing items, together with pleating, make up the effects that help to attenuate the most masculine lines. As a finishing touch for the label’s darkest collection to date: fur, dark stones and bright details.